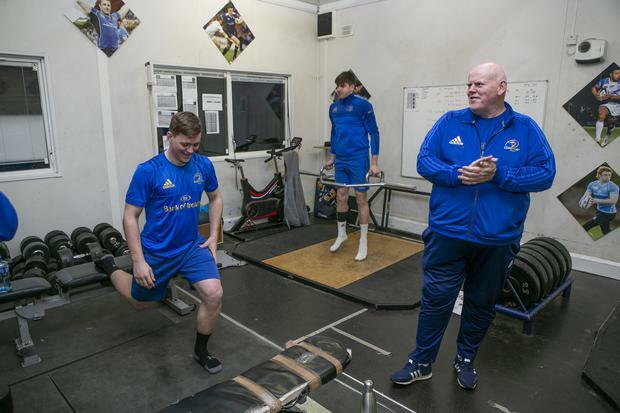 Conor Kelly (19) and Aaron O’Sullivan (19) with Dave Fagan Head of S&C in the Leinster Rugby Sub-Academy pictured at an early morning Session in Donnybrook. Dave Fagan has climbed out of bed in Edenderry at 4.45am most mornings for the last 20 years. The Leinster Academy strength and conditioning coach heads up the road to oversee the invisible force that drives Leinster forward. The Leinster Sub-Academy, not Academy, is a dark place where the weeding-out process takes place, four days a week from 6.45am. This season, there are 23 young men going through their paces, made up of five from Year One and 18 working towards making it into the Academy. “That year is a preparation year. It is a springboard,” said Fagan. The environment is there to bring players down to earth, to show them the reality of what has to be done. Dave Fagan, Head of S&C in the Leinster Rugby Sub Academy pictured at an early morning Session in Donnybrook. “Quite often in schools rugby, players come out with a huge reputation. Flanker Scott Penny is the exception to the rule that most have pencilled in the Ireland U20s and All-Ireland League as goals to be scored. In the past, Fagan has had to have serious face-to-face talks with many men that have gone on to play for Ireland. “I remember putting the gun to Jack McGrath’s head and threatening that I wouldn’t take him any further unless he did more. “I knew he wanted it. You know with others they don’t want it enough. “They are in love with the badge,” Fagan stated. “That is what the Sub-Academy is about, finding out how much they want it. “A player has got to want to be the best he can be. The Leinster Schools Senior Cup is the scouting ground where Leinster’s Academy Manager, Peter Smyth, Provincial Talent Coach Trevor Hogan and development officers have their opinions confirmed or compromised. “In these weeks, the schools players are on live television in the Senior Cup. “They are a headline in a pull-out part of newspapers, cheered on by everyone in the school. It is about how much the players want it when no one is looking. “Anyone can say, ‘I want to be a professional rugby player’. “Give me a day in January when it’s quarter-to-seven in the morning, below freezing and we are out warming up on the field in the pitch black. “Show me someone who is enthusiastic then. That’s when you know when a player really wants it. “You don’t make it hard for hard’s sake. You have to have a certain amount of sacrifice. “I would be hard on them because you have to be. You have to find out how much they want it. “There is no use for Leinster or the individual to go easier and find out it is not for them after three years in the Academy. The results higher up the Leinster ladder suggest this is time very well spent.